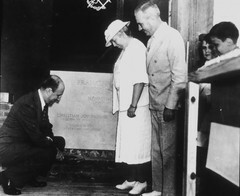 Secretary of the treasury, Henry Morgenthau wields the trowel during the cornerstone laying for the National Institutes of Health, National Cancer Institute's building 6 on June 24, 1939. Mrs. Luke Wilson, whose husband, a cancer victim, donated the land for the building, and Dr. Thomas Parron, the Surgeon General of the U.S. Public Health Service, look on. The PHS was then a part of the Treasury Department.